Rayman 2: The Great Escape, known as Rayman Kaizokusen Kara no Dasshutsu! (レイマン 海賊船からの脱出！) in Japan, is the sequel to Rayman, brought to several video game platforms including the Sega Dreamcast in 2000. Developed and published by Ubisoft, it was the first 3D Rayman game, and follows Rayman as he liberates all his friends from a gang of evil pirates. The Glade of Dreams was at peace until a band of evil robot pirates, led by the extremely evil Admiral Razorbeard, take over Rayman's world, and to make things worse, smash the Heart of the World into 1000 pieces (Yellow Lums)!! Rayman is captured, too, and thrown in a cell on the Pirate Prison Ship. Globox, Rayman's best friend, is sent by Ly the Fairy to get captured and give Rayman a silver Lum that regenerates his fist. Afterwards, Rayman is able to shoot glowing orbs from his fist that attacks enemies. Globox gives Rayman more Lums along the way to make his fist stronger. Rayman can also obtain a golden fist that doubles the power of his fist. Rayman sets out to collect the 1000 Lums, and retrieve the 4 Masks of Polokus, to awaken him so that he can help Rayman save the Glade of Dreams and defeat Razorbeard. Compared to other versions of the game (for the PlayStation, Nintendo 64 and PC), the Dreamcast version of Rayman 2 boasts smooth 60 FPS gameplay (with no hiccups) and a 1-4 player multiplayer mode. The game also features an internet section (typical to many Dreamcast games) where the player can visit the Rayman 2 website. The Dreamcast version also features the Globox Village as well as Glob Crystals that can be collected for bonus mini games. Globox Disk is a mini game that was first available exclusively to the Dreamcast version that can be unlocked by collecting all the Glob Crystals. Up to four players can play at once. This mini game would later re-appear in the PlayStation 2 version of the game titled Rayman 2: Revolution. Alternatively, the mini game can be unlocked by entering the following cheat at the title screen: Press then hold both and triggers and press four times. The Dreamcast version of Rayman 2 was the base version of the iOS version and of Rayman 3D for the Nintendo 3DS. Main article: Rayman 2: The Great Escape/Magazine articles. Main article: Rayman 2: The Great Escape/Promotional material. 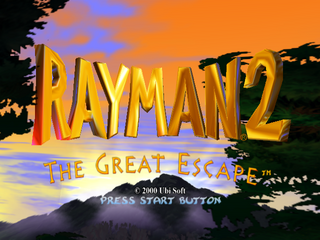 Rayman 2: The Great Escape can utilize the Dreamcast Visual Memory Unit to save game progress, unlocked features including content received from the Rayman 2 Web Site as well as save game configurations. There are also three bonus levels that were previously made available from the Rayman 2 website accessed through the in-game web browser. They would be accessed similarly to regular save game data. Once loaded, the bonus level will immediately load.